I love our school. We’ve been going to Colfax Charter Elementary School since Emily enrolled in kindergarten in 2001, and since then I have accumulated literally hundreds of friends who are in my iPhone contact list – most whom I am happy to say are probably not dodging my call. I’m on the Restaurant Committee, which is the team that lines up monthly fundraisers at local restaurants that give our school 20 – 30% back. We publicize the event on our marquee, on Facebook and Twitter, in an email blast, and by putting flyers in the kids’ backpacks. These events take place during the school year, but recently I suggested that we try our hand at summer fundraisers as well. With the exception of flyers in the backpacks, we could publicize the events every other way, and instead of a monthly event, we could make them bi-weekly since the kids and parents will certainly miss each other and want to have a mass gathering. 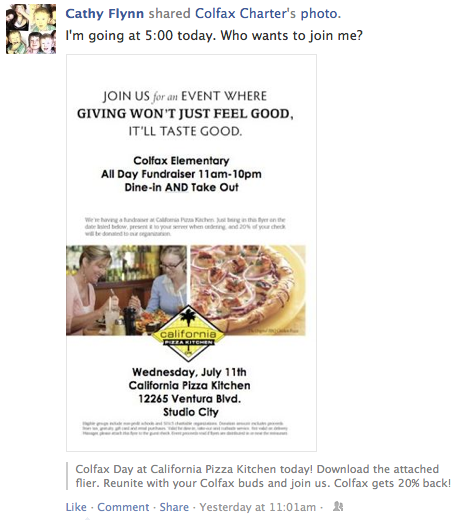 The first fundraiser of the summer was yesterday at California Pizza Kitchen. Our last CPK event at the beginning of the 2011-12 school year brought in over $800 in profits for our school, so I was anticipating more of the same. I’m going at 5:00 today. Who wants to join me? I sent emails to everyone who was in Jake’s kindergarten class, and any other kindergartners who were in my address book, and even though it’s been a year since Mary moved on to middle school, I invited all her friends as well. As I picked up Mary from drama camp in the Colfax auditorium I shouted out for everyone to join as for dinner at CPK at 5:00. I did the same when I picked up Jake from Colfax’s Farm Week Summer Camp. Right before we left for dinner, I looked at my Facebook post to see how many Likes, Comments or Shares I had for the gathering. Not a one. Nada. Zip. Bupkis. Colfax’s Facebook page had one Share: Mine. Usually at least someone would have given me a half-hearted Like, which might be something in between a 🙂 and a 😦 – maybe like a , but then that would have required a Comment, and as I just said, there was nothing. This post was in Facebook Wasteland. Who wants to join me for my annual dusting of the ceiling fans? Who wants to join me in the heart of a Sig Alert? Who wants to join me at the DMV? At least these posts might have sparked a laughing :-)) or winking 😉 response. Undaunted, I forged ahead with my dinner plans. Mary, Jake and I arrived at 5:15, just to add a little time for possible latecomers. Unlike last fall’s CPK fundraiser, there was no long line of cars waiting to be parked from CPK’s complimentary valet. There was no crowd of four dozen people outside waiting to get a table. And as we walked in, there were customers at only three tables, and I didn’t recognize a one. I thought of walking away without buying anything. We actually don’t have the luxury of eating out in our budget. The bill just gets tacked on to the credit card we won’t have the money to pay off until I start back to work on Season 2 of Once Upon a Time next September, and September is still a long way off. But CPK only offers free valet parking if you get validated, and you can’t really get a validation if you don’t buy anything. Also, since I’m on the Restaurant Committee and the only member in town who could participate, I’d be a hypocrite to walk away without buying something. I decided to get the food to go since I was going to get something for Tom anyway. Fortunately Emily’s a vegetarian who doesn’t eat wheat or dairy. I’d just tell her the whole menu would give her the trots. I ordered a kid’s mac & cheese for Jake, kung pao pasta for Tom and jambalaya pasta for myself, and the portions had better be enough to split it for lunch tomorrow, dammit! Mary wanted pizza AND salad, and I nearly choked. That girl always has champagne tastes with our beer budget, or since Tom and I don’t drink, it’s kind of like Dollar Tree apple juice vs. Martinelli’s sparking cider. I told her we have frozen pizza at home, so she settled on the Caesar salad. No chicken. The bill came to $46.93, and I tried to look on the bright side: over 9 bucks back for our school and I didn’t have to pay a tip for a waiter. We sat at the counter waiting for our order while Jake colored in the kid’s menu and Mary practiced her Belle lines from Beauty and the Beast. No Colfax families. No big 20% back check. No fun reunion. But this was a public place and I would look like a wacky woman. On the other had, no one here knew me. There weren’t any Colfax families here to witness it. I wanted to cry even more. I held it together. Barely. About ten minutes later, a miracle occurred! A Colfax mom arrived with her 4th grader. Heather and I did the Box Tops fundraiser a year ago, and I was so happy to see her, I wanted to cry – in a good way. But it turns out she was having a special mother/daughter dinner while her husband and son were gone fishing, so I didn’t want to intrude. A couple of minutes later, Lina arrived. This is when I really want to cry, and not in a good way. Lina is my mother-in-law, and I invited her to join us for dinner. She drove herself to CPK after a hard day at work, and here I was, about to grab my to go bag. I had completely forgotten that I had invited her. I offered to stay and get a table or buy something for her so we could go home or to her house and eat it, but she was obviously despondent. I could tell she felt rejected, and I didn’t blame her. I mostly felt terrible because I assumed she was feeling terrible that I didn’t have the thought to let her know that the evening was cancelled. She walked away without validating her ticket, and by the time I caught up to her she had already paid the valet. That’s when I started to cry. It began as a silent whimper. I felt sorry for my mother-in-law and our little school and the fundraiser that didn’t bring any money. That whimper snowballed into a bottomless shame pit. You’re the dork who thought we could have a successful summer fundraiser! No wonder no one came. Nobody likes you anyway! How the hell are we going to pay for this meal anyway? Now your kids are hearing you cry out loud and they’re going to either be scared or think you’re emotionally unstable! You really are emotionally unstable. Doesn’t a straightjacket in a rubber room sound like a good solution? I used to go down this rabbit hole a lot in middle and high school, but I thought I had gotten better as an adult. Obviously not. By the time I got home I was blubbering like an idiot. My husband Tom has absolutely no personal comprehension of the mood swings created from PMS or menopause or insecure women feeling downright bonkers. But he gave me a hug anyway and wondered out loud how such an intelligent lady can spin out of control so quickly. He invited me to go to Family Swim at the Y, where no one would question why my mascara was running. And after watching Jake dog paddle while wearing his goofy goggles, I felt better. Maybe someone will click the Like button on that one. Does that mean they Like me? Or do they Like that no one likes me? I shouldn’t be on the Restaurant Committee for my elementary school. I should be enrolled in the elementary school. Because clearly, my self esteem in this instance is still in the 1st grade. On the bright side, our little CPK fundraiser ended up with 14 Colfax receipts, taking in $605.80 and a donation of $121.16. Thank you so much! I’m so grateful I could cry. sorry. we didn’t make it in:( thank you for all the hard work and time you put into our Colfax community. Thanks Grettel. Right back atcha! Cathy – I hope in the cold (yeah right) light of day you recognize that this wasn’t a rejection of you, a dismissal of your work, or disinterest in supporting the school. It is, at worst, “summer brain.”. I love the ease of the restaurant fundraisers, as well as their low stress nature – which is to say we don’t feel guilty if we don’t/can’t make it, because…well… because its not like someone is going to cry if we don’t make it. Right? Except for me in a “less-than” mood. Time to grow a little skin. I can’t imagine that no one showed up for you. How devastating! Especially since you just being you would be such a great draw. Okay… I absolutely LOVE this post. I can relate on about 17 different levels, and I feel so much better that I AM NOT ALONE. Oh, and I’m old enough to know better. Where oh where is that “wisdom that comes with age” when you need it? Isn’t it supposed to keep you from crying in the parking lot? Oh I feel so sorry for you. But you know what they say about school fundraisers? The event you think will bring in hardly any money, that will be the most unexpected amazing sucess of the year. And every year you will have one “bound to make us a fortune” event that will be a complete flop. I think you should reward yourself with a little “me time” for all your efforts. You deserve it. Thanks Ellie. It did make a little money, which is a little more than we would have in our chest if we didn’t have the fundraisier. I’m glad you made. 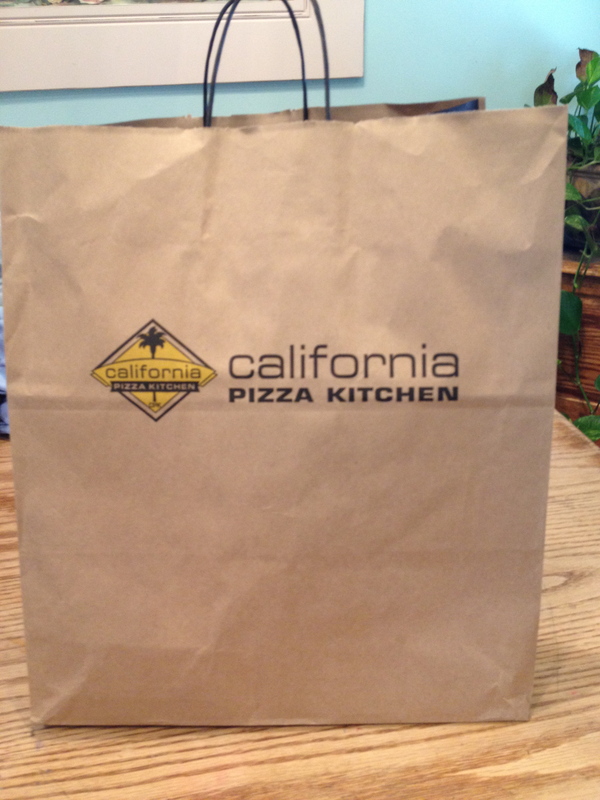 Don’t you wish CPK was just a bit less expensive? But then they probably wouldn’t be able to afford to have fundraisers like this. I just started reading your blog. I know this post is a few weeks old, but I just wanted to tell you that these things happen to the best of us! And sometimes you just need to allow yourself to feel sorry for yourself and have a good cry. Keep up the good work! Thanks for commenting and welcome to my blog! I’m so glad you came late because I didn’t realize I had all these comments that I needed to reply to.